I've been running some numbers over our solution to try and make things more efficient. While I was at it, I figured I would put 2013 head to head with 2015. Across the board, we have significate improvements. 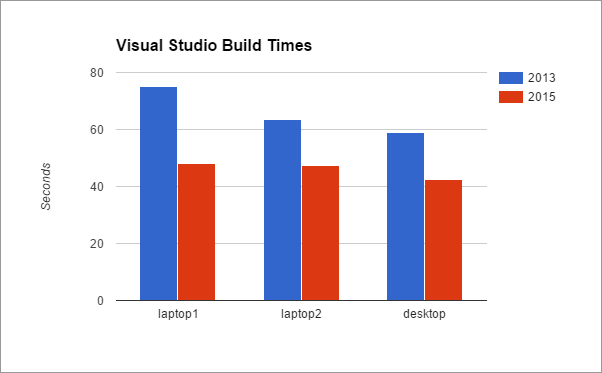 Visual Studio 2015 is just faster. And since nothing obvious breaks for my solution, at this stage I will be using it as the faster choice going forward. This test only ran across one solution with 30 C# projects, across 3 very similar machines, only 5 times each. For a more conclusive answer, you would want to run this across a whole range of extra solutions and machines. But from this limited view, I'm really impressed by the perf increase of builds that 2015 provides me, for my particular code base, at this point in time. During this exercise of measuring I can across one other nice conclusion as well. Restoring NuGet packages on a large solution with a complex dependency graph is much faster when using the command line, rather than letting visual studio load them on demand right before a build. I didn't get any hard numbers yet, but it feels significant. It took 2-4 minutes for VS to finish loading NuGet packages before it started building, versus the same dependencies loaded from the command line in 20 or 30 seconds. It is true that I am using a locally hosted NuGet 2 server, and that could be a factor, so your mileage may vary. But I usually find that command line tasks do come out faster compared to GUI ones, and this is one I will change my habits over.